Have you ever taken a long phone call only to realize that you completely forgot about what you were cooking and burned a pan so badly that it seemed beyond repair? Well, rather than chuck it in the trash bin, or even the recycling bin, for that matter, try one of these earth-friendly tricks to get your pan shiny and like new again. Depending on how badly you burned it, one or a combination of methods, most of which use common ingredients found in your kitchen pantry, should work. Do a bang up job cleaning your pan with some baking soda and water. Simply simmer for a while then cool. Let it soak overnight if necessary. Another alternative is to leave a paste of baking soda and green dish soap in your pan for several hours. Wash your pan well and if anything remains, sprinkle some more baking soda or a DIY aromatherapy cleanser into the pan and scrub away. Cola is super acidic and does well loosening burnt-on messes like caramel. Pour some in your pan, simmer gently, and then scrape the gunk off. Then sit back and enjoy a cola. Slather your pan with a gloppy mixture of water and cream of tartar, which contains potassium hydroxide and tartaric acid. Let it soak overnight. Wake up to a pan that will be as easy as pie to clean. At the very least, you should have dish soap and water in your house, right? Add some water and a squirt of green dish soap to your pan and bring it to a simmer. Let it go for a while. Once it's cool, if the burnt-on food isn't easily budging with an eco-friendly scrubber, try soaking it overnight. Skip the margaritas and use the lime juice and salt for your pan. Let the mixture sit for several minutes, sprinkle in some more salt, and scrub away. You’ll be amazed at how easily the burnt-on food lifts away. What can you do with that wine that you left accidentally uncorked after your last party? Instead of tossing it, save it for cleaning your pans. Use it in place of vinegar in the above tips and rest happy knowing it's come to some good use! This technique is great for burnt-on stains that remain. 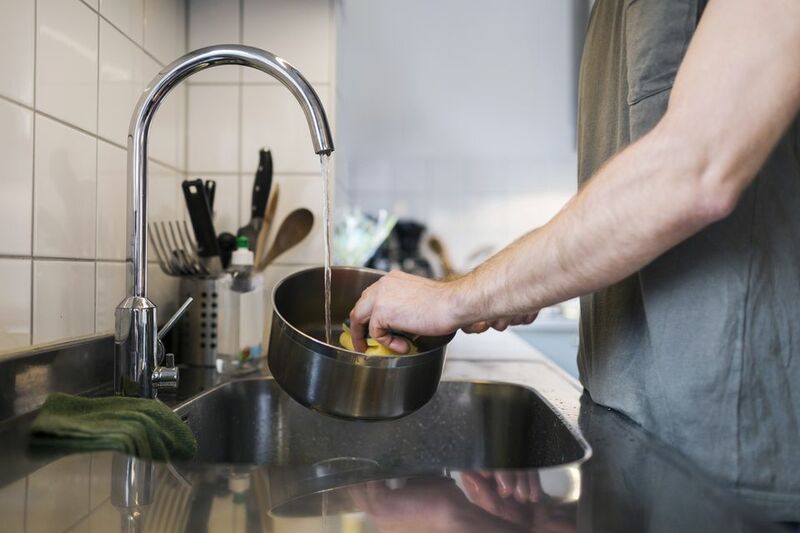 Soak your pan in a solution of green dish soap, hot water, and oxygen bleach liquid or powder, such as Seventh Generation's Natural Oxy Stain Remover. Let it sit for a while. It should come off easily. Use with an oxygen bleach powder if you have it. If not, try baking soda or another eco-friendly scrub. Boil some water with a good dose of sodium chloride to loosen stuck-on gunky, crusty food. Scrape with a wooden spoon now and then to loosen bits. If it's still not budging, let it set for several more hours. Then pour the water out and use more salt to scrub away any remaining burnt areas. You might not have enough tomato sauce left over for that big pasta dinner you planned, but it will do the trick at removing burnt-on foods due to its acidic nature. Pour in a generous portion of tomato sauce or crushed tomatoes (whether canned or fresh) and simmer gently for several minutes, but don't let the water cook out of it. Add in some more water if necessary. You can also leave it in the pan overnight without cooking it. Vinegar contains acetic acid, so it works well at breaking down burnt-on, crusty food. Grab whatever you got on hand (e.g., apple cider, white vinegar, etc. ), pour it in the pan with some water and simmer. Keep the lid on unless whatever you burnt stunk up the whole house. In that case, leave the lid off, and the vinegar will act as a natural room deodorizer.